We’re happy to introduce our newest contributor, Yin Khvat. Yin was born in Manchester in the UK and has lived in Australia for the last six years. She is currently on a short stay in Taiwan and has a particular interest in Cambodia. A woman is selling green coconuts off the back of her motorbike on the dusty street. With a scythe, she deftly chips the head of the coconut into a point, then guillotines the tip to reveal the sweet juice and tender white flesh inside. 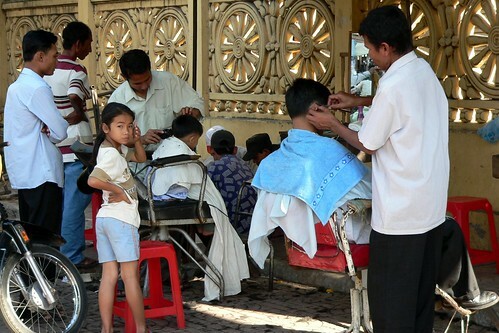 Next to her, a barber has set up on the pavement, his shop made up only of bare necessities: a mirror and chair. Young men in makeshift stalls, with car parts hung up on tarpaulin walls, observe you languidly as you watch them, curiosity returned for curiosity. On the corner, policemen in blue on their motorbikes look a little seedy, restricted in their uniforms, smoking cigarettes and surveying the traffic. This is a typical street scene in Phnom Penh: a living, breathing cross-section of life in the Cambodian capital. Some look at this and see disorder, or a blight on the city’s beauty. Others see freedom, vibrancy, and the right of everyone — including the poor — to make a living. The city council has attempted to “reorganise” these small stalls — sometimes known as “romantic stallss” — believing they are messy or unhygienic. But for the time being, at least, it seems their efforts have not succeeded. 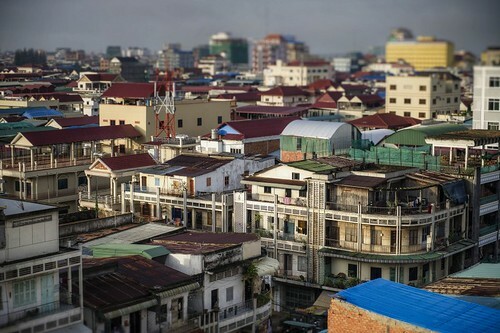 Phnom Penh remains a capital city where the poorer sections of society can sell and provide services as the market demands, without the need to lease expensive commercial space. 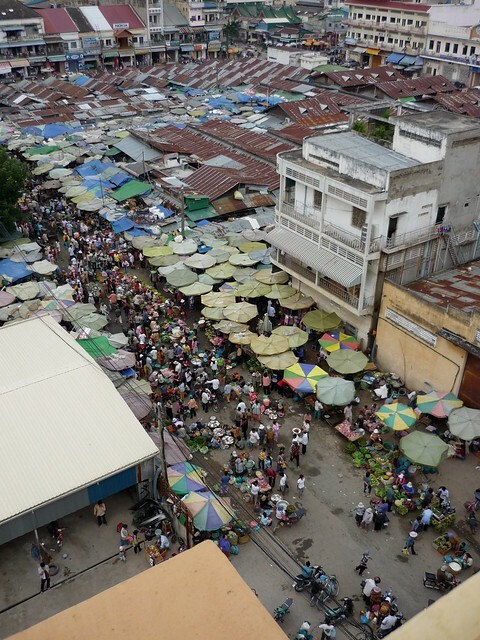 But the stalls are part of a bigger social fabric, one which appears to define the Cambodian way of life. You see it not only in streets lined with people selling their wares, but also every afternoon and evening along the banks of the Tonle Sap River and Chaktomuk — the “four faces” where the Mekong and Tonle Sap Rivers meet. On Sisowath Quay, especially, people spend their free time sitting, walking and dancing with friends and family. They enjoy each other’s company under their city’s skies. Take one of the popular boat trips down the river and it is another episode of this same documentary, in which the delineation between viewer and object is blurred. You are watching them as they are watching you. The social interaction is thrilling, an essential element in a society where social integration is the outcome, binding people together and folding lives in on each other. No doubt the warm weather and dense population contribute to this phenomenon, as does the economic devastation wrought by the Khmer Rouge and the civil wars through the 1970s and 1980s, from which Cambodia is only now recovering. But what of the social legacy? When I asked how people here can be so warm after the horrors they have faced, I have been told that many Cambodians “live and let live.” That many adhere to Buddhist teachings that there is good and bad in all of us, and that forgiveness is part of living. Many Cambodians want to put those years behind them. And so perhaps what we get is something I can’t help feel is unique to Phnom Penh. This is city that is unafraid, welcoming, generous and open-hearted. Tourists don’t need to be invited into the homes of Cambodians to interact with real people, or to get a good taste of life here, of what Cambodians do and how they live their lives. This society has a transparent, wonderful, communal feel — even after what it suffered just a generation ago. In the evenings, throngs gather outside the golden temples. They have already knelt en masse before the Buddhas to make their offerings and to pray for the health of their loved ones, in amongst a heady intoxication of incense and lotus flower in the air. In thick traffic, noses to bumpers, people interact with others on motorbikes and in tuk tuks. Looks are flashed, gestures made, laughs carry across banks of traffic. This hot, humid city is alive: its beat is easy to find and the pulse unmissable. Cities like this move you. They touch you. They inspire and engage your imagination. Because it’s about feeling you are part of something. Deep down we all want to be part of something. I’m told that in parts of the Cambodian countryside people live on communal land, owned by big extended families. Small houses are linked by small passages; there are no fences. The families designate one house for TV watching, another for dancing, another for weddings or religious ceremonies. And each family plays its part in helping each other organise these shared events, as well as in growing rice in the fields, and in building new homes. In richer, colder countries, where living is arguably of a higher standard, many people have lost any real social integration. More poignant still, they tend not to be aware of this loss. They retreat behind closed doors and wall up in their privacy so that only those invited in may enter their worlds. To outsiders, and perhaps even to insiders, the city is closed, detached, and blind to what happens outside of people’s homes. In ”The Life and Death of Great American Cities”, Jane Jacobs argues good urban planning should encourage people to use the city’s public spaces because it makes for better cities. Not only are the people happier, but the place is safer. More of the private needs to become public for there to be the connections between people that existed before. On very rare occasions on the tube in London, perhaps around Christmas or New Year, different factors can conspire to make it seem like a whole carriage is communicating, jesting, talking out loud to one another. These are unique, fleeting moments in a confined space, usually with the warmth of alcohol, and the afterglow of a good night out. If you’ve ever experienced this, you’ll agree: it is magical. Everyday barriers come down and you have the confidence to reach out to people you usually ignore. For a short space of time, you actually feel part of the society to which you belong, rather than hundreds of individuals keeping to themselves within the confines of their own narrow circles. In Phnom Penh, magic like this occurs all day, every day. Life and people interact and integrate, spilling out onto the streets, unafraid and with open hearts, in glorious, romantic, messy fashion. I hope it stays this way for awhile. This entry was written by Yin Khvat , posted on Monday October 08 2012at 11:10 am , filed under Asia Pacific, Europe, Public Space, Society and Culture and tagged Cambodia, Hawkers, London, Phnom Penh, Streetlife . Bookmark the permalink . Post a comment below or leave a trackback: Trackback URL.